Earn up to $0.20 for every click. We'll pay you for all clicks you generate, and you can earn up to $0.20 per visitor. 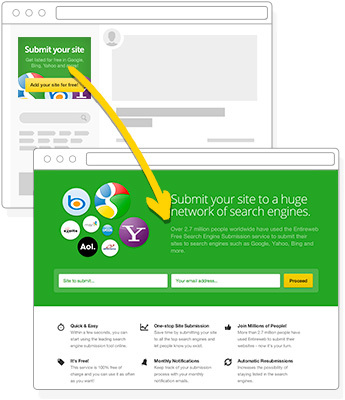 You'll be promoting a Free Search Engine Submission service with a very high conversion rate. Anyone, anywhere with any type of site can join this program and start earning money within minutes! Within minutes from signup, you'll be up'n running and have started to earn money from your traffic. 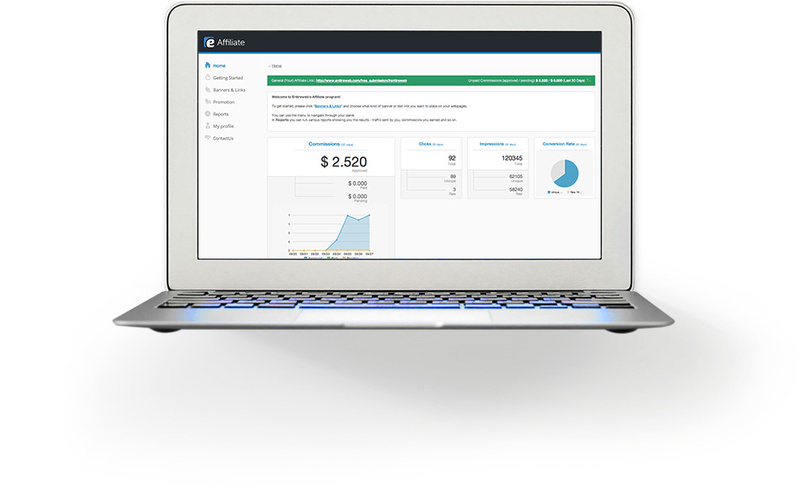 Welcome to Entireweb´s affiliate program. This affiliate program is free to join for anyone, and you'll get paid for every click you generate to our Free Search Engine Submission service. A visitor clicks on your affiliate banner or link on your site or in an email. We'll pay you both for the first initial click, but also if the visitors goes through the process. The program is powered by Post Affiliate Pro, the leading affiliate tracking software. Post Affiliate Pro makes sure that all referrals and sales are tracked correctly. The process is fully automatic. All your clicks/visitors will be properly tracked. It even works if cookies are disabled in the browser of the customer. The customer can visit us months after your referral and the click will still be tracked. A will to earn money - that's it. You don't even need a website (although having your own website helps). You can promote our Free Search Engine Submission service via search engines, postings in internet forums, tweets, posting links on Facebook, pay per click ads, etc. All you need to do is to send a visitor to our site via your affiliate link, and we'll pay you for every click. It's as easy as that. The Entireweb Free Search Engine Submission is a 100% free service, meaning you often see very high conversion rates, and we'll pay you up to $0.20 per click! We pay our affiliates by PayPal. All earnings will be paid on the end of each month for the previous month. All payments are in US dollar. We do not support other payment methods. The minimum payout value is $50. You must enter your PayPal email address in your affiliate account settings in the payout options. Otherwise, we cannot pay you. You may NOT use the Entireweb affiliate program to refer yourself to the Free Search Engine Submission service. The banners and the links of the affiliate program may NOT be used in spam emails or other spam activities (blog comment spam, forum spam, etc.). In that case, your affiliate account will be terminated and outstanding commissions will not be paid.